Yagyu Sanma no Kurai is very important concept to know and I am sure we can apply this concept not only to kendo but to learning in general. Yagyu is short for Yagyu Shinkage-ryu in this case. This school is one of the well-known kenjutsu schools in Japan and it is still practiced by many people. Yagyu Shinkage-ryu was founded by YAGYU Sekishusai Muneyoshi who was asked to complete KAMIIZUMI Isenokami Nobutsuna’s Shinkage-ryu (mid-16th century). San is three. Ma means “to polish”.Kurai here means “level”. So basically it says, there are three levels to polishing your kendo.What are the three levels? Firstly, narau, “learning”: we learn from our teacher. We listen to our teacher very carefully and do as they say. Repeatedly we practice what we learned from our teacher. This is the first level. Secondly, kufu, “work on”: we tweak or work on what we learned. This includes serious thinking and experimenting. We have to follow our teacher’s instructions, but to get it work for ourselves, we have to think well how we can acquire what we’ve learned. This is not “to innovate”. We don’t make new things but follow the teacher. 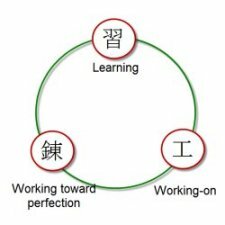 Lastly, neru, “working toward perfection”: we repeat the kufu over and over in order to make what we’ve learned perfect. But we all know perfection cannot be achieved that easily. We go back to the narau (learning) level and go through the same process. Interestingly, there is another theory of Sanma. The first and third are the same, but the second is keiko. Keiko is “training” in English. So you learn and practice what you learn and tweak it. I do not know why there are two theories. Basically, both theories tell us that we have to listen to our teacher sincerely and humbly. Practice what we’ve learned and tweak it to acquire what we’ve learned. Take what we learned to the next level. In other words, train ourselves to perform what we’ve learned perfectly ANYTIME. That is why we should keep training. Can you strike perfect men three times in a row? I cannot. Every time I strike men, I have some things to fix such as the angle of my left foot, tenouchi and so on. This sounds like common sense but it is not easy to do. Probably that is why we have such teachings as Yagyu Sanma no Kurai.